Two-Face breaks out of Arkham, intent on getting revenge on Rupert Thorne. Batman realizes that the longer Two-Face is in control, the farther Harvey Dent recedes away, possibly to be lost forever. Batman feels obligated to find and stop his friend Harvey. Two-Face stages a break out at the state penitentiary, freeing several criminals he previously prosecuted. Batman recognizes the escapees as half a potential gang. He knows Two-Face will next strike at Blackgate. When Two-Face arrives, batman is already there, but Two-Face releases the prisoners. They attack Batman. Meanwhile, Two-Face and his gang appear to escape via boat. Gordon and the GCPD stop them, but Batman recognizes Two-Face as a fake. He finds the real Two-Face still inside. Batman and Two-face have a tense discussion regarding who’s in control, Harvey or Two-Face? 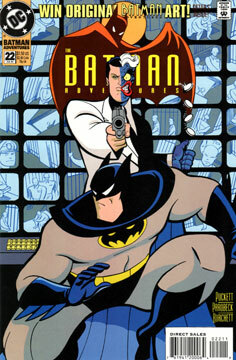 Batman puts this conflict to the test when he hands Two-Face a gun and tells Two-Face to shoot him. Two-Face can’t pull the trigger, proving Harvey is still in there somewhere. This is a solid Two-Face tale. I always enjoy such stories that explore Two-Face’s duality. Too often he’s portrayed as just another thug. In many ways, he’s the most psychologically damaged of Batman’s rogues. Puckett delivered in fine form, given the limitations of the title. If this were fleshed out a little more, it would make a fine animated episode. So much good Parobeck! Every one of those thugs and guards had a personality. Two-Face in a guard’s uniform, or dressed as a fireman might make fun customs. Developing his “half” gang could be a fun project.